At Bulbs.com we installed the 2x4 LED recessed troffers and love the customization abilities of Spacewise. 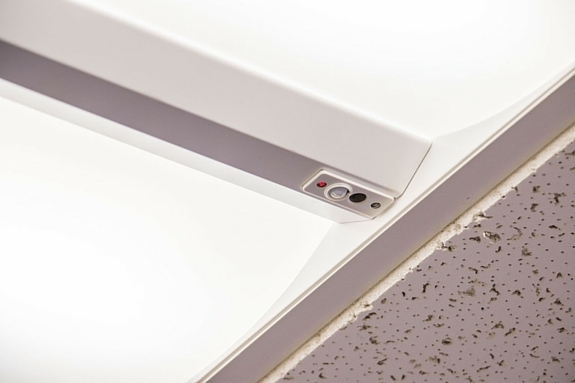 The 2x2 LED recessed troffer is also available with Spacewise technology, both troffers are easy to configure and easy on the wallet with the potential savings up to 75% in energy costs. Open Plan: Fixtures will dim 10 minutes after people leave their workstations to maintain an ambient light level and turn off when no occupancy has been detected in the whole group for 10 minutes. Private Office: Possible to adjust lighting from default settings, these adjusted settings will be remembered during brief vacancies and resume when lights are switched on manually or automatically, depending on settings. Private Conference: There are four presets to alter light levels and set the proper mood for the conference room. Two presets can be adjusted to custom preferences. Corridor: When presence is detected, the lights will go up to background level and when stable presence is detected the lights will ramp up to task level, decreasing to background level after the space is unoccupied for five minutes. Emergency: Lights rise to task level when motion is detected or lights are switched on. If the battery pack is specified then the lights turn off after the time that is configured in application mode. You can also select ‘path of egress’ for fixtures which will maintain a background level of light as others in the group turn off. 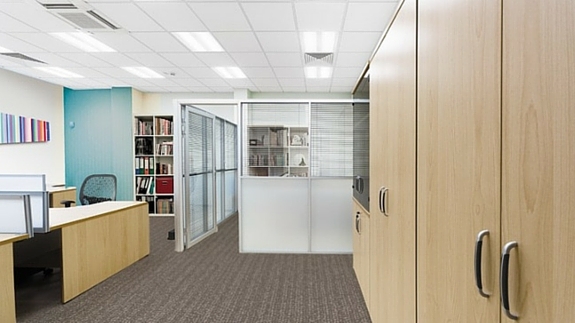 These settings provide guidelines for how groups of fixtures work together to maintain only the level of light that is required for that space. You also have the ability of personalizing individual work spaces with brightness settings which can be set for each fixture. Individual daylight sensors enable the system to take advantage of natural light, dimming only the fixtures necessary to maintain the light settings. With each fixture having its own occupancy sensor each can individually dim down according to its settings. If it senses that there is no one nearby, the fixture will dim down to 66% and increase its brightness when someone re-enters the room. Spacewise provides light when you need it, where you need. The wireless connection through which the lights communicate doesn’t rely on an existing wireless internet network to function, they provide their own stand-alone network. This wireless technology means there is no need to tear apart walls or ceilings to run complex and expensive wiring-reducing installation costs. Philips Day-Brite DuaLED fixtures with Spacewise technology have a rated life of 50,000 hours so they won’t need to be replaced for years to come. Additionally, many utility companies are now offering lighting rebates- Philips DuaLED troffers with Spacewise are DLC approved which means they will qualify for many fixture rebates up to $130 per fixture. If you’re interested in learning more about possible rebates or have questions about Philips Day-Brite DuaLED troffers with Spacewise technology, our certified Lighting Specialist are available at 888-455-2800 to help. »A Review of 2015 Rebate Programs and a 2016 Look Forward «Award-Winning Sengled Snap is now in stock!